There are several kinds of fakes in Colombo. Fake bags, fake shoes, fake love affairs, fake professionals, fake this and fake that. The biggest fakes, however, are many of the people that we hang around with and what is strange is that we know they are fakes but yet keep up the pretense of liking all of them, making us fakes too. ‘Why do we this and allow the charade to go on?’ is the question that we should ask ourselves. Being an enabler is mainly due to the dread of being dropped out from the party circuit and the anxiety of being unable to hobnob with Colombo’s fake glamour world of rent-a-crowd. It was amusing to see the invitees to the recent opening of a Fancy Kitchen shop. They certainly were not the domestic goddesses of Colombo but a rent-a-crowd of women who would never step into a kitchen in their wildest dreams, leave alone cook or how to turn a cooker on. The same goes when it comes to fashion shows. The majority of the invitees look as if their fashion wardrobes have come from a jumble sale; the bored look on their faces during the show is priceless. When there are some canapés served around they all come to life and do a dash towards them to gourmandize as if food is about to go out of fashion. Mr. and Mrs. Popular who always project how wonderful they are to gain cheap popularity, noveau riche people, especially those who wish to move around with the more affluent and high and mighty, always bestow generous gifts and have lots of dinner parties. The sad part though is if one of them have some personal problems they cannot confide with any of these hoard of invitees as it is guaranteed that it would turn into malicious gossip that spread like wildfire just the second the confider leaves the premises. I am sure that all of us have seen the picture perfect painted dolls in town who are at all the celebrations and functions beaming like the Mona Lisa of this world having only nice things to say. They are so sweet that one could almost feel the ants biting at your ear when they express such sweet things about everything. I was made to understand that in their own homes they are so psychotic that living with these individuals are like hell for the rest of the family and the employees at home. True colours and the ugly side of the individuals come out that sometimes the others feel like getting an exorcist down. Neighbours and domestic aide do gossip. Does one have a true and loyal friend is a good question every individual should ask themselves. If they do have a couple or a number enough to be counted in one hand or even have one, that person is blessed. Loyalty and genuine friendship certainly has gone out with the Ark. Fake friends are in plenty and renting a crowd seems to be the easiest thing in this village. To be real in this ever changing world has become an uphill task and kudos to the person who lives in reality and feet firmly planted on the ground. I love reading Koluu's articles, it's so funny and very true. 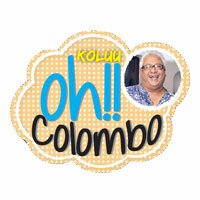 When ever I have a look at the HI magazine, I always feel how true Koluu's articles about our fake Colombo society.